Puerto Vallarta is recognized by many enthusiasts for its amazing waters, picturesque shores, smooth sailing conditions and unparalleled fishing. There is perhaps no better way to experience what may be the premiere destination on the planet for offering an extensive variety of water activities then from a luxury yacht. The conditions make for the ideal outing to key destinations, for example, Snorkeling in Playa De Los Arcos, Playa De Las Animas for lunch, whale watching out on the deep blue ocean waters or catching an adrenalin rush while reeling in a sail fish. Whatever it is you choose, our goal at Puerto Vallarta Yachts is to provide an experience that will create lasting memories for a lifetime. Our Captains and team are handpicked and come with decades of yachting experience. Type of Yachts vary in size, style, capacity and are comprised of scuba yachts, angling yachts, luxury yachts, sailboats, and mega yachts all accessible for contract. Lengths start at 40' and extend to more than 120' and can be matched to your specific occasion and event whether it last for a day or a week. Yachting with Puerto Vallarta Yachts translates to 5-Diamond Service, on board valet, all inclusive dining and beverages, modifiable schedules and a sound blend of travel alternatives. Safety is always first with fun at a close second when chartering a vessel with us. We take pride in surpassing each of your desires and anticipate offering you our assistance with planning your fantasy getaway with us. Our water crafts are the ideal venue for almost all occasions including wedding proposals, weddings, commemorations, special nights, birthdays, quinceaneras, corporate occasions, retirement parties, graduations, reunions, pledge drives, and dedications. Whether you’re a bachelorette or have an agenda where every line says FUN, all occasions come catered with amazing dishes from one of our gourmet specialists, and a bar full of your favorite beverages. Music is a must and the on board valet will see to it that you hear all of your favorites. Crewed yachts ordinarily are comparable to the cost of a voyage on a cruise ship or a quality hotel, the difference, when on a Luxury yacht you are experiencing the pinnacle of seclusion. You and your friends will be the primary focus of your own chartered crew, and while the Captain may steer the boat, you will provide the direction as to what destinations are visited and what events celebrated. Since each charter carries a different list of to do’s from our clients, it is impossible to provide a totally accurate cost here on the website until we better understand what it is you are looking to achieve while with us. It is for this reason we ask that you contact us via email or phone, and we will answer any questions that you might have. Our company is based out of the United States, Canada and Mexico so that we can better serve your interest. Make your next daytime or night unforgettable by celebrating with us at Puerto Vallarta Yachts! 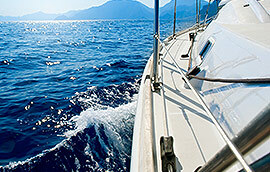 Simply call and you will see why we are the top yacht rental organization in Puerto Vallarta, Mexico.